Microsoft has made XP an ex-Operating System. As of 8th April they won’t be fixing any problems so your operating system is wide open. What does that mean to you? If you’re still using XP you won’t get any more updates to fix security issues. That means that if someone discovers how to get access to your system by running a bit of script on their website, you become vulnerable to them running riot in your computer with no means of help. An IT support company is unlikely to be able to help so you really are wide open. 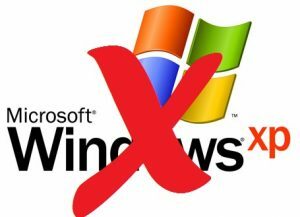 You could upgrade to Windows 7 or 8 – but the challenge is that, if you’re running XP, you’re probably using an older computer and it may simply not have the right spec to run the more up-to-date operating systems. This means you may have to look at a nice shiny, new computer! Upgrading is likely to cost somewhere in the region of £100, so if your computer can handle it, it’s not a huge outlay. However, if your computer isn’t up to the newer system it’s probably way overdue for replacement. Be ready to be amazed at the speed it will operate at if you’re used to an older machine. If you’ve got questions about any of this please do give our help desk a call and we’ll be happy to help.